Chapel of the Flowers has an experienced Concierge Team ready to make your Las Vegas wedding truly memorable. Our wedding experts will create your all-inclusive wedding package by adding a hotel stay for you and your wedding guests, arrange all your celebration dinners and can even book a legendary helicopter tour to the Grand Canyon! Contact our concierge today to plan your all-inclusive wedding. Chapel of the Flowers is the only Las Vegas wedding chapel that provides a Wedding Concierge solely devoted to the entire wedding celebration- and the concierge services are free! Your personal wedding concierge is available via email, phone, online chat, or for in-person appointments at our chapel on the world-famous Las Vegas Strip. 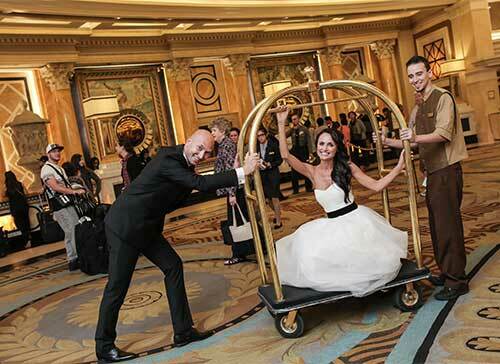 Whether you're planning to elope or having an extravagant wedding and reception with hundreds of guests here in Las Vegas, your wedding concierge will help ease the stress and coordinate all the additional amenities and activities for your Vegas trip. Call today for any question about our all-inclusive Las Vegas wedding packages! Eat, Drink, and be Married! Our helicopter wine tour is perfect for anyone with a passion for wine and food. Your day will start with a limousine transport to your private helicopter which will whisk you away to the Pahrump Winery for an exclusive wine tasting, 4-course meal, and special keepsake bottle of vino. Your day will conclude as you return to Las Vegas taking in a tour of the Red Rock Canyon and Las Vegas Valley. These 4.5-hour luxury wedding experience is available for up to 6 people.